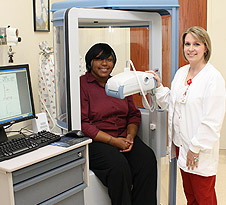 United Regional provides testing services to diagnose asthma, emphysema and other breathing problems. This test measures how well the lungs can provide adequate oxygen to the body and subsequently remove carbon dioxide. Analysis of blood gases helps evaluate a person’s respiratory and metabolic status. This test is often used to determine the presence or absence of asthma. Lung function drops as a result of inhaling the chemical methacholine, which constricts the muscles around the airways in the lungs. Spirometry, or the measuring of breath, is the most common of the pulmonary function tests and uses an instrument called a spirometer to measure the amount of air entering and leaving the lungs. The test is often used to help diagnose and determine the severity of COPD. During the test, the patient takes a deep breath and exhales completely. Results of the test are then recorded and analyzed by the spirometer machine. Respiratory Services is located on the first floor of the Bridwell Tower and offers services Monday through Friday 8 am to 5 pm.